Our fireplaces are at their best when there’s a bright flame in the grate and a crackle in the air, and our customers love using them during the colder months of the year. When it warms up, however, your fireplace is still one of the main features in your room, and there’s no reason why it has to stay bare and empty, just because you don’t need to light a fire. Here are some Summer alternatives that you can try. Mantel ornaments – the mantelpiece is the ideal place for ornaments, and is often the resting place for cards, invitations and family photos. There’s no reason why you can’t change what you display on your mantelpiece in order to reflect the seasons. Use an eye-catching piece of china, an un-framed print, or an ornament you usually keep elsewhere in the house. 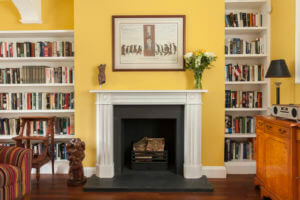 Introduce more colour to your mantel to brighten your room. Flowers – flowers are a great way to mark the seasons and to bring the outdoors into your home. You can choose fresh flowers that sit on the hearth in front of your grate – use tall flowers and a big vase to add height to your fireplace. Many people also use dried flower arrangements, which don’t need water or tending. Garden centres, craft shops and hobby outlets all sell a wide variety of dried flowers that can be arranged in your grate for a summer effect. Candles – this is another popular way of dressing up your fireplace for summer. Your candles can be decorative or practical – or a mixture of both. There’s certainly no shortage of choice on the high street – choose candles of varying sizes, shapes and colours to create a centrepiece. 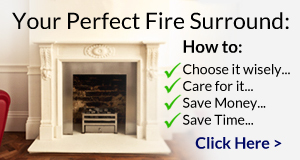 Screens – take a look in your local antiques shop to see if you can find a suitable fire screen to sit in front of your grate during the summer. Original fire screens were designed to keep the direct heat from turning ladies’ faces pink, and came in a wide range of sizes and designs. Contemporary fire screens can also be found, giving you the choice between traditional and modern. 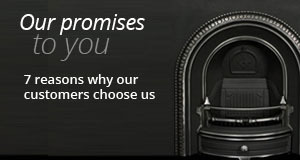 If you would like to know more about our range of fireplaces including Marble Fireplaces and Victorian Fireplaces or if you would like to know more about specific types of Fireplaces and Fire Surrounds, then please call us on 01730 897600 or email us at info@englishfireplaces.co.uk. 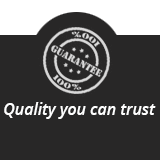 We are very helpful and will be glad to answer your questions and offer advice.